Includes software with DJ features such as playlists, mixes, loop functions, pitching, etc. This is a terrible peice of kit...you could easily get a midi controller cheaper 2nd hand that will be sooo much better.Even if your buying it for a beginer don't bother. dmc world championships here i come!! A more appropriate word is run from this deal. I'll give you a clue; Aerosmith. Yeah, it looks and feels like a toy but even so, is a lot of fun - but only for an hour or so. By that point you will be wishing you could cue music on headphones (it has no internal soundcard, just one output) and you will find that the platters frequently stop responding when you are rewinding a track. You'd enjoy one of the Hercules DJ controllers far more. 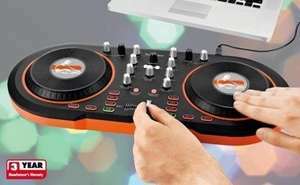 DJ Cross Lite Edition from Mixvibes. The software is somewhat limited but pretty good.